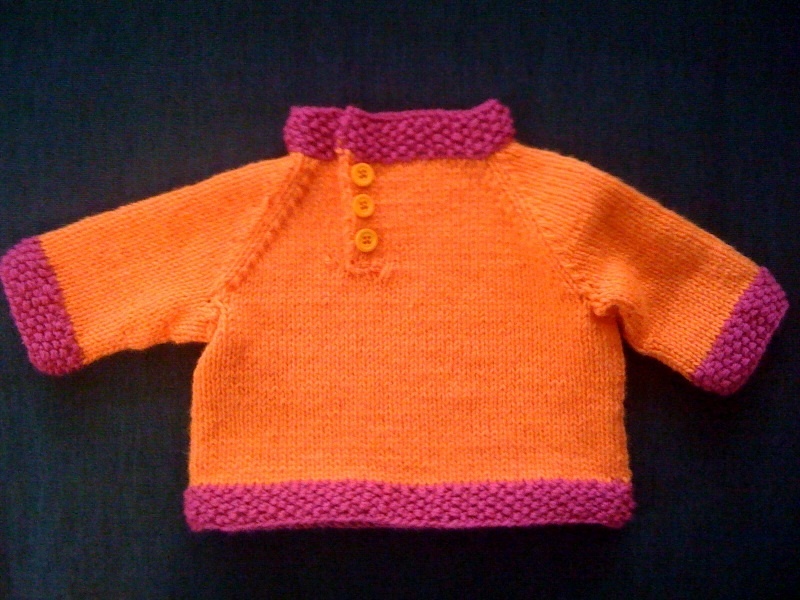 Shawn requested that I knit something for a co-worker’s baby shower a couple of weeks ago. I didn’t have the time (or the energy) to make a baby blanket, so I decided to attempt the “Child’s Placket Neck Pullover” from Joelle Hoverson’s Last-Minute Knitted Gifts. I’ve been wanting to work this pattern for a while now, so this was just the opportunity. I went out and purchased some Plymouth Yarn Dreambaby DK Solid in orange and magenta. I wanted to do something more colorful than pastel pink. (They knew they were having a girl.) So I went with more of an Oilily color palette. The pattern was not the most clearly written, but I was able to work it out after reading it over a few times. The actual knitting was pretty easy. I was nervous about joining the raglan sleeves, but it was pretty simple. I think that knitting a few pairs of socks helped because they use a similar stitch for the gusset shaping. I had to make a few modifications to the pattern in order to use the two colors. Mostly in the placket area. The original calls for seed stitching on either side of the placket that joins with the collar. I couldn’t figure out how to switch yarns while still having it attach correctly, so I just used stockinette instead. I also decided to do an asymetrical placket to give it a little modern feel. Instead of doing buttons, I sewed in snaps on the placket and then stitched on some buttons in the front for decoration. Snaps are easier to deal with for squirmy babies, plus I think that button-hole knitting skills leave something to be desired. All in all, I am pretty impressed with myself on how well it turned out. Yeah for me!! !